On June 18, 2009, the Bordeaux Chamber of Commerce organizes an international video conference on wine and new technologies between Bordeaux and San Francisco, CA. This is the yearly Bordeaux conference, called Numeriglobe, on new technologies. This year, two themes are singled out: healthcare and wine. Of course, I’ll be speaking about wine with the French and American representatives from Crushpad, Bottlenotes.com and vinobilia.com. The French ones will be in the room with us while their American counterparts will be in San Francsico. The purpose of this manifestation is to show the links between two important wine worlds: Bordeaux and California. In both countries, new technologies are developed to promote their local wines or wine in general. My loyal readers now know everything there is to know about Crushpad in San Francisco and Bordeaux while bottlenotes.com and vinobilia.com are newer to this blog. I heard about Vinobilia a few months ago and met with Thierry Lay, one of the co-founder. Vinobilia is an international endeavour as I like them: the main partners are American and European. Dan Browne, who was the guest of the Internet radio show The New Wine Consumer, is American while Thierry Lay is French with a strong international background. Vinobilia is a real international wine community: the site is available in French, English, Polish, Russian and Chinese. But the most innovative feature of the site is the vinogram. How does it work? Everyone has some preferences in the wines one drinks – wehether it’s red, white or rose. 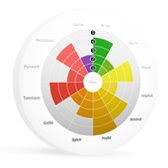 Take the test and enter your favorite aromas and flavors in wine. The site will create the profile of your red, white or pink wines. Looking for a wine that fits your preferences? Either you’ll find it on the site or on a shelf. How so? Vinobilia is now working with some one line and brick and mortar wine stores to have them create a vinogram for the wines they sell! The idea is really bright and I have a few questions to the founders of the vinogram. Of course I’ll save them for our June 18 Conference but will give you more details on vinobilia.com. Previous post: Facebook, dream or nightmare?